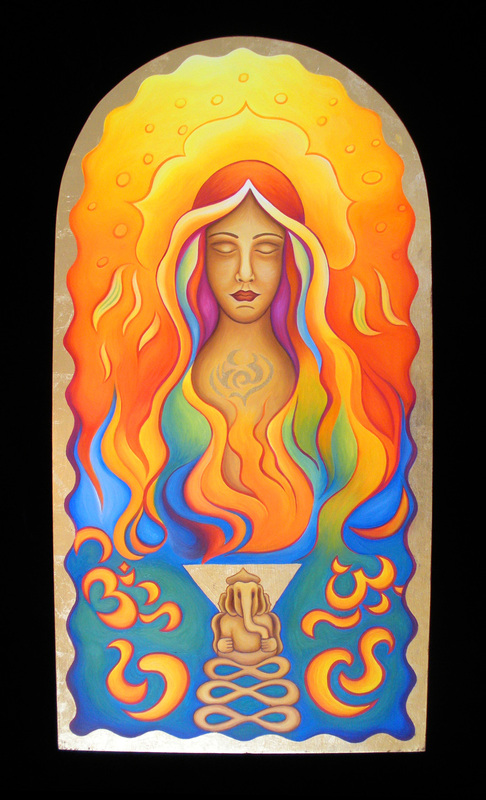 From my “Mystical Madonnas” series comes “Amber”. I was inspired to paint her from my meditation practice of Agnihotra. She represents me with my eyes closed in front of the fire during my meditation practice. Lord Ganesh is in front of the fire, where he is always placed. There are Om symbols on either side and there is the shape of a lotus flower above my head. I wanted to paint my meditative “experience” as best as I could and this is how it came out. This is a limited edition of 250 giclée prints on canvas or watercolor paper. The original painting has not been sold.